A licensed Speech-Language Pathologist position will screen, evaluate, develop and provide treatment plans for patients. Communication skills and coordination with other staff members are critical in this position. The duties and responsibilities of this position are governed by licensure regulations and practice acts of the state in which they are employed. The statements below reflect the general duties considered necessary to describe the principle functions of the job as identified and shall not be considered as a detailed description of all of the work requirements that may be inherent in the job. The omission of specific statements of duties does not exclude them from the position if the work is similar, related or a logical assignment to the position. Follow SKILLED THERAPIES policies, procedures, rules and applicable laws and standards; Follow SKILLED THERAPIES policies and procedures for the delivery of patient services. Screen patients according to protocol set by Director of Rehabilitation. Determine each patient’s need for skilled therapy based on objective and documented criteria. Evaluate patients according to schedule set by Director of Rehabilitation. Conduct the evaluations according to standardized or recommended techniques and procedures in a timely manner. Develop treatment plans at the end of the evaluation that includes measurable, objective, long and short-term goals for each patient based on documented data. Follow each treatment plan in an objective, measurable and documented approach. Coordinate daily work schedule with Director of Rehabilitation and other disciplines. Complete all scheduled treatments. Request assistant or adjust therapy schedule to avoid interference with the quality of service. Communicate daily to the Director of Rehabilitation any patient or scheduling changes that would inhibit the delivery of treatment. Maintain timely and accurate records according to policies, procedures and regulations which include evaluations, screenings, progress notes, discharge summaries, labor and service logs. Maintain active and supportive communication with the patient, significant others, physicians and other team members concerning progress, problems, home programs, follow-up and other issues related to the therapeutic process. Maintain a positive rapport with staff at all times through professional appearance and actions. Communicate pertinent information on a timely basis to supervisor and seek guidance necessary for performance of duties. Respond appropriately to clinical supervision as indicated by improving skills. Keep informed of current educational, Medicare regulations, medical guidelines, clinical trends and procedures through attendance of at least one conference or seminar a year. Review and co-sign documentation to assure appropriate clinical services are delivered in accordance with the state licensing Practice Act. Responsible to adhere to productivity expectations established by the Director of Rehabilitation. Keep state license and TB test current and in good standing; provide copies of this information to each Director of Rehabilitation and SKILLED THERAPIES Human Resources Department. Demonstrate responsibility by reporting to work on time and providing proper notification for absence or tardiness per company policy. Demonstrate responsibility by reporting to work on time and providing proper notification for absence or tardiness per company policy. Perform other related duties as necessary or as requested. Evaluations, screenings, progress notes, discharge summaries, labor and service logs are accurate and up to date. 100% patient satisfaction in both providing treatment and follow up communication. License and education requirements are in good standing and up to date. Arrives at the job every day on time and ready to work. 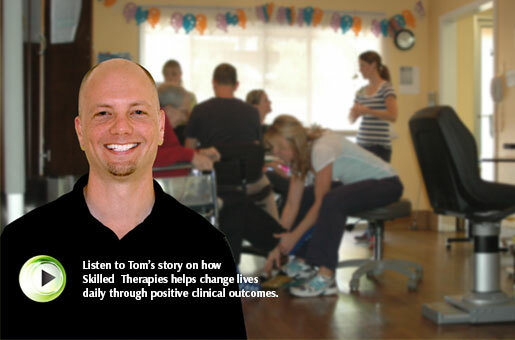 Graduate from an approved certified therapy program (Bachelors, Masters or Doctorate). An M.A. or M.S. degree in Communicative Disorder/Speech-Language Pathology for Speech and Language Pathologists. Current certificate and/or license in the state in which they are practicing. Geriatric experience preferred but not required. Must demonstrate effective communication and organizational skills. Must prove competency in the provision of therapy services in accordance with acceptable standards of practice. Regularly required to use and/or push wheelchairs according to manufacturer’s guidelines. Start and end times of workdays will vary according to patient scheduling needs. Dress code may be required in work area. The noise level in the work environment is minimal. Minimal exposure to physical risks, such as operating dangerous equipment or working with chemicals. Minimal exposure to unusual elements, such as extreme temperatures, dirt, dust, fumes, smoke, unpleasant odors, and/or loud noises. Minimal exposure to electrical and radiation exposure. This is a Category II job classification per OSHA standards. Minimal exposure to blood borne pathogens. Chemicals known to the State of California to cause cancer, or birth defects or other reproductive harm may be present in the work environment.